One of our favorite ways to play is using our five senses! This week for our A Very Toddler Fourth series we have tried 4th of July Frozen Yogurt bars (sense of taste), squished, dumped, and mixed patriotic colors for our Color Lab (sense of sight), dropped, transferred and clanged American flags in buckets for our Toddler Flag Sort (sense of hearing), and smelled lots of vinegar and baking soda fizz while making a fizzy flag (sense of smell). 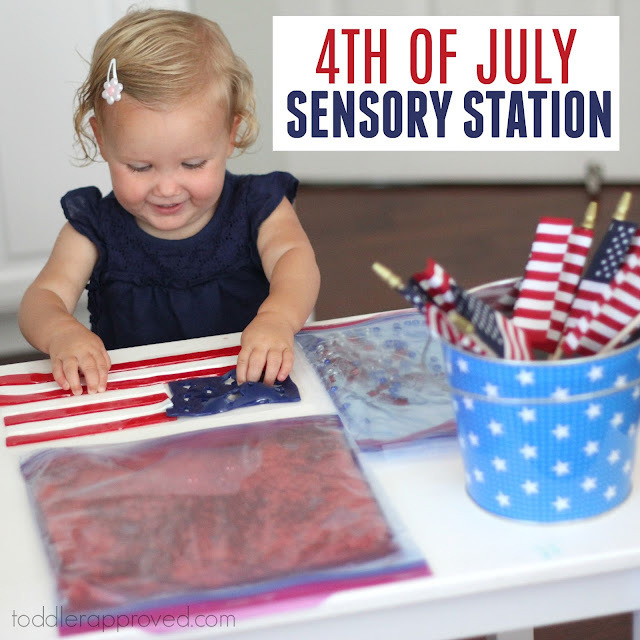 Today we are using our sense of touch for a 4th of July Sensory Station! 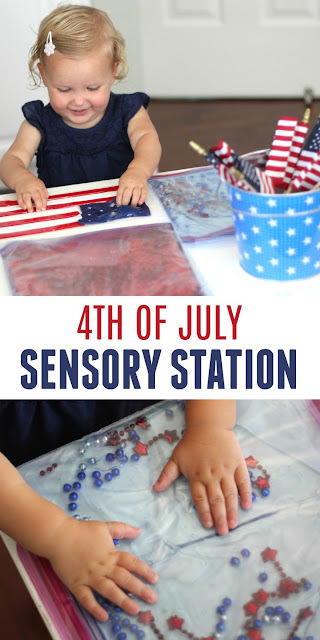 We grabbed a few items from the Target dollar area along with some items from our craft cupboard and made these sensory station in just a few minutes! To get started we grabbed our favorite IKEA table and stuck our new American Flag window cling to the table. We took the top piece of plastic off of the window cling and then stuck it to the table attached to the bottom piece of plastic. The plastic was stuck to the table using tape, but my toddler would easily pull and squish the flag while she played. It was a huge hit! If your toddler is still into the stage of eating everything, you might want to skip the window clings. Next we made two 4th of July sensory squish bags! In one large ziploc we put shower gel (tinted blue) and fourth of July beads. We zipped it closed and double bagged it to keep it extra secure! Then we taped it to the table to keep it in one spot. Our next bag contained water, glitter, and red food coloring. We tried to get as much air out of it as possible before we sealed it closed! We also double bagged this one. If your toddler is super curious and sometimes destructive, you may want to duct tape the edges so that she can't open the ziplocs. Mine isn't able to do that yet! We had so much fun squishing, pulling, and banging on the items while exploring our sensory table! This was such a hit that my older kids had to join in too! Lastly, we added our buckets of flags to the table so that kids could move the flags around and transfer them from bucket to bucket. This sensory experience was the perfect way to end our A Very Toddler Fourth series! We made still have one or two activities to share with you over the weekend, but hopefully now you have a bunch of ideas to try with your toddlers for the 4th of July! Make sure to go to our A Very Toddler Fourth landing page to find all 9 activities that were shared this week!